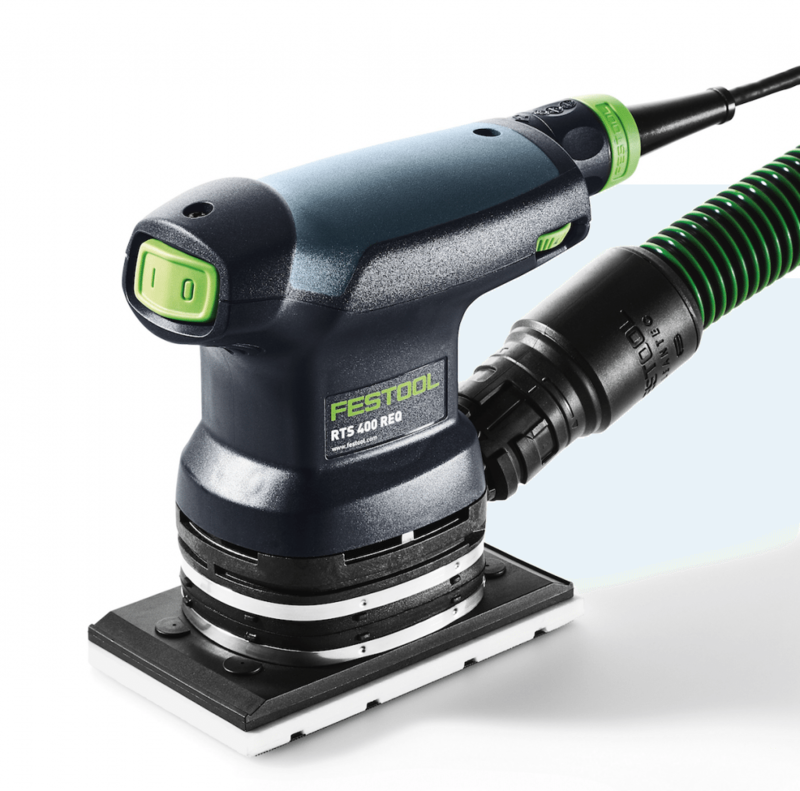 Festool has improved the functionality of these tools in the new generation for 2017. The new orbitals (RTS/DTS400REQ) sport a new motor with more power, less vibration, improved balance and controls. The basic size and shape of the RTS and DTS remain the same. On first glance, you won’t see much difference. Even holding it in your hand, there’s not much difference between the old EQ and the REQ models. When you turn them on, you’ll feel some design changes. 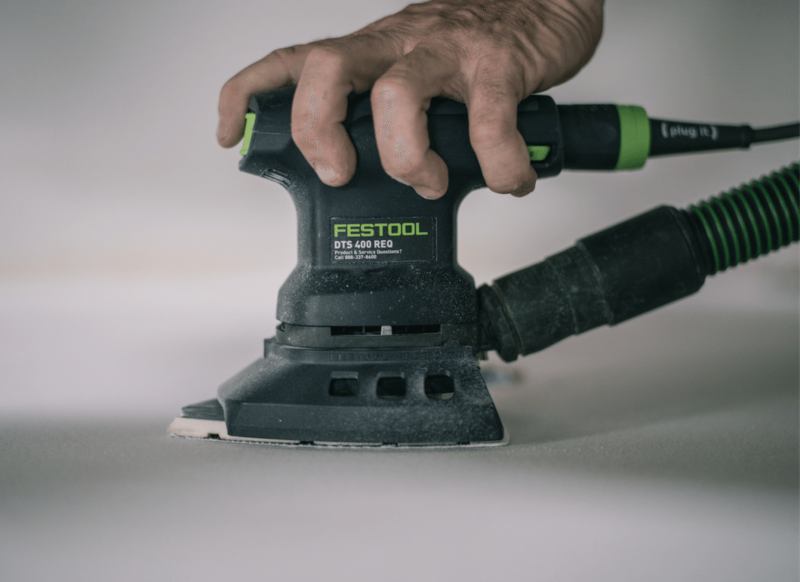 Publisher’s Disclaimer: Festool provided these tools to us at no cost for a test period. We don’t publish reviews of all products that manufacturers submit to us for testing. From time to time we highlight new, innovative or redesigned technologies that are introduced and relevant to professionals. All product review information we share is objective, honest, unbiased and 100% our own. ON/OFF switch – the older versions have a hard plastic inward facing switch with stiff click action, while the new REQ’s have a more finger fitting and pointed convex switch with better action. Let’s face it, you have to hit that switch to use the tool. It’s nice when it has better feel and action. Speed Control – A location improvement. Instead of being awkwardly tight to the plug it cord connection at the rear of the tool, the speed control is now located at the left side of the upper housing where your palm grips the tool. It’s an easier adjustment that is less likely to disrupt workflow for users of all levels. You don’t change speeds all that often, but everything should be easier. Grip – The top of the sanders, right where you hold them in your palm, now have a more comfortable soft grip coating than the previous, which had a hard plastic feel. The grip of the tool is now easier to work with for extended periods. For users who sand more in hours than minutes, there is a cumulative effect. The sanders continue to feature a user friendly 2mm stroke pattern. So, more power and same stroke. Better design and electronics help the motor to reduce vibration, which is the primary cause of fatigue in extended tasks. You know, the numb claw hands you don’t want at night. This is the biggest impact change. Locking Hose Port – A better connection where you capture the dust. The “bayonet” style connection is better than the old style ribbed twist on connection, which wasn’t bad. The main benefits are that your dust extractor hose can’t twist during use and certainly will never come off unexpectedly. 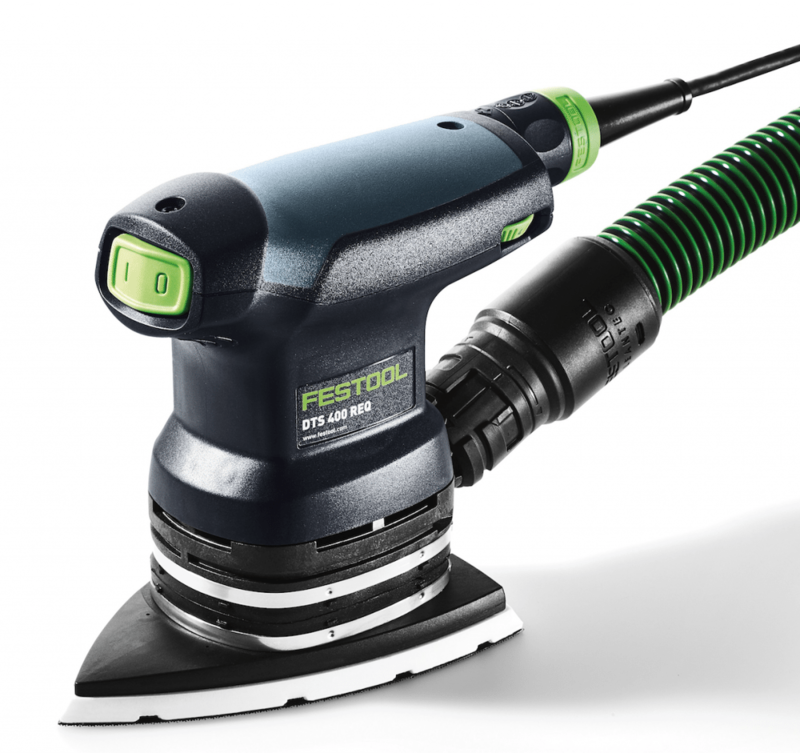 Protectors – Taking a cue from the Rotex line, Festool orbital sanders now have pad protectors (or “adjacent surface protectors“) that are easy to put on and take off when you want a small barrier between the edge of your pad and any surface adjacent to that which you are sanding. As always, the new RTS has it’s classic square pad edge while the DTS moves forward with it’s nicely beveled edge. Sometimes we put orbitals in lower grit material removals tasks where it is nice to protect pad edges. RTS REQ with edge protector and dust bag. The new long life reusable bag ($30) capability is a big improvement and handy for those times when it is not safe or practical to connect your sander to a CT dust extractor. If you have the extractor, you are on it most of the time. A good dust bag is helpful to have around, and the bayonet style dust port holds this long life bag much better than the old EQ versions held the Turbo disposable paper bags. 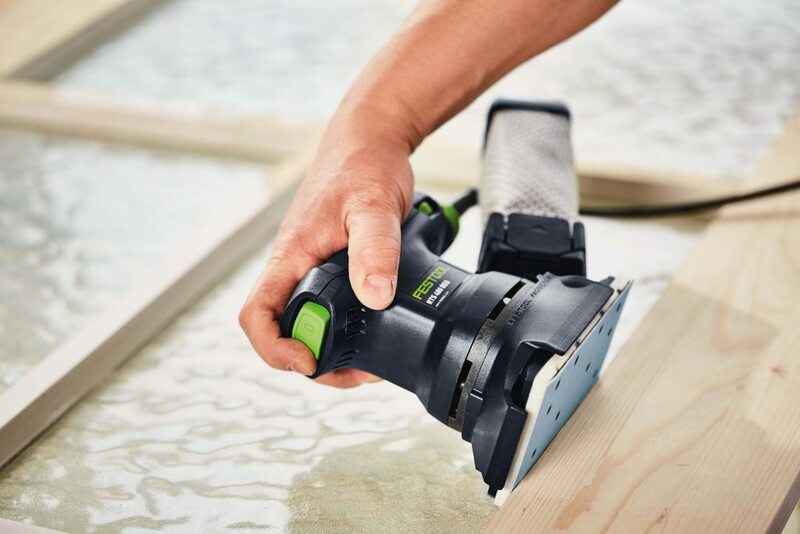 The 30 day money back guarantee and 3 year warranty make these fine finish Festool orbital sanders worth looking at for folks who are just getting into the Festool system as well as longer standing users who are upgrading or adding to tool kits. How have your experiences been with DTS and RTS sanders? I ordered the DTS400 and returned it after initial testing as the sanding pad and abrasives were wearing out at the tip pretty much straight away. Had it swapped for the RTS400 and so far so good. Not used the dust bag, but have connected to my Mirka extractor and that works fine. You only get one sample piece of abrasive, which I personally found to be incredibly disappointing. Hi Dave, yes that leading point on the front of the DTS can be fragile in some situations. The DTS and RTS, for being so similar, are also quite different. And yes, it would be cool to get a little more selection on the abrasives that come with. Thanks for sharing.